You may have heard the phrase “Pomodoro Technique” being thrown around your office or even in conversations about keeping productive online. It’s becoming increasingly popular with those looking to improve their focus in the workplace and is incredibly simple to adapt to your daily routine, hence why it has become a favourite method of many knowledge workers. This methodology can help you bring some much-needed productivity to your everyday to-do list and even kill off any procrastination that rattles your day. You’d be wrong in thinking that this method is a traditional Italian cooking process, it’s definitely not, but, in fact, it is a process. The Pomodoro Technique was created as a time management tool in the 1980s. 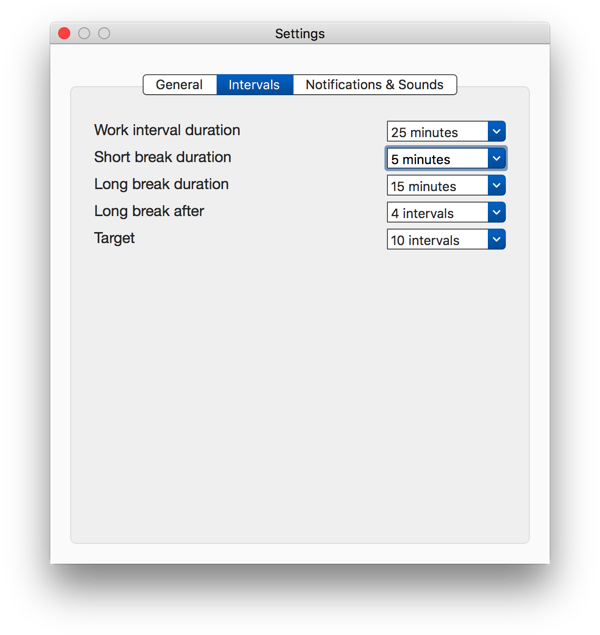 A productivity enthusiast, Francesco Cirillo, developed the method in an attempt to help control the timings of your work by breaking your work sessions into intervals, easily manageable with a timer. The technique has been adopted by hundreds of thousands, even millions of people needing a much-needed dose of productivity into their day. From office workers to students and everyone in between, the method has been embraced as a process to save time and effort. You start with a timer, this can be an egg timer or even your smartphone as you get started. The first cycle of any Pomodoro is traditionally 25-minutes long, the recommended stint to work in. A timer set for 25-minutes indicates your focused uninterrupted working period of time. These 25-minutes should be used for intense work. This period of time will help you to complete the task at hand and reduce any form of distraction by providing you directly after with a scheduled break to relax. After this time is over, traditionally, you take a short break of 5-minutes. During this short break, you are welcome to relax, browse the internet or mingle with colleagues. After the 5-minute break, you begin another “Pomodoro Cycle” of 25-minutes. Each cycle is separated by 5-minute short breaks, aiming to give you a focused stint of time to work with planned breaks to reduce stress and keep you on track. A Pomodoro cycle is a full 25-minute focused session, combined with a 5-minute break. In its basic form, this is how the method works in day to day practice. This time management technique has been adopted, expanded and grown into many different formats, but has helped many people to keep focused and boost success with work tasks. The premise of the method is to help you to spend focused time on work and avoid unproductive moments of browsing the web or being distracted. In today’s busy world, there are many cases of professionals working below their standards and in many cases can be attributed to distractions in the workplace like social media, over-checking email and even other people around them. This is the case for most situations, a student distracted by another student in the university library, or even an office worker getting nudged via email. The technique provides individuals with the ability to monotask and focus their attention on the task at hand during the cycle. There are a host of underlying principles that support the Pomodoro technique that will help to improve and refine your Pomodoro cycles. Completing four full cycles, take a longer break of 20+ minutes and reset your count to zero in an effort to reduce strain on your progress. These are the simple steps to starting with the technique. Why does the Pomodoro Technique work? The Pomodoro Technique is something many people have taken great benefit from. Using the method during your daily routine can add a layer of structure to your workload by breaking down the key tasks and assigning time blocks to your routine. Many of the most avid users started small. Using a simple timer for 25-minutes has given them a sense of control to their hectic routine. A Pomodoro timer can be a simple resource that creates a hugely valuable way of working for many and can be applied to so many situations. Adopting the method has changed the way many people work by adding a formality to their tasks, no matter what the task is, at hand, using the technique provides a framework that adapts to all and any situation. How to use a Pomodoro Timer? 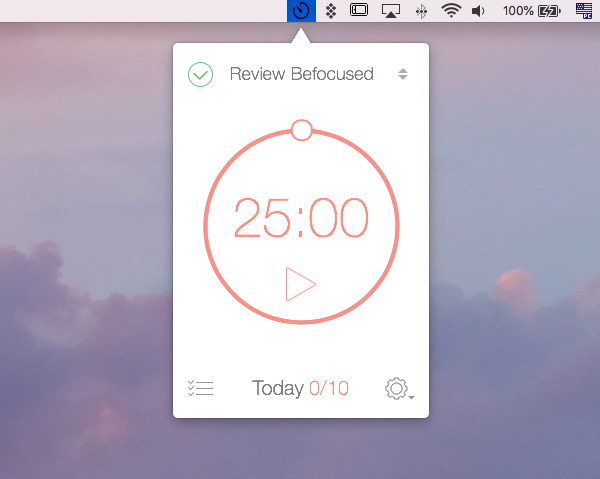 There are many different applications out there that we’d recommend to you, but for the purpose of this demonstration, let’s use BeFocused Pro, which is available via the Setapp subscription. This is a strong example of a Pomodoro timer. Starting your Timer. Start your timer and type the task title into the taskbar and begin your time by hitting play. Logging Tasks. Once a full cycle is completed you will see a “1” appear in the red circle. They will be logged in the “done” section. 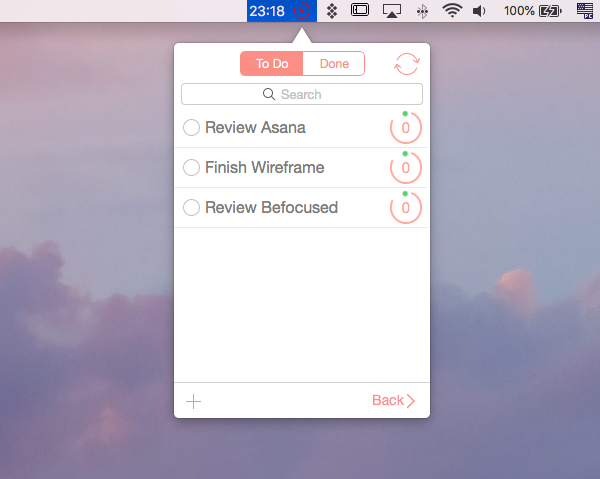 Any active tasks can be viewed from the “to-do” inbox. Modifying the Settings. From the settings, change the interval times and a host of different preferences. As stated, there’s no one size fits all with the Pomodoro timer. The timer does give you a sense of flexibility, with the duration and process. One of the most adaptable elements is the timer duration. Changing how long it can take for your cycles can be a useful way to customise your process. The suggested 25-minute block doesn’t have to stick and many timers will allow you to change this. Individuals might work more effectively with a 40-minute stint of time. Or even a shorted 15-minute stint, it can depend on a multitude of factors. For example, a developer might find that sessions of 40-minutes help for concentration and completion of most of his tasks. Whereas, an administrative staff might only need 15-minutes with his/her tasks to accomplish a full cycle. The people in your immediate environment. Despite all efforts to reduce noise or disruptions, this can still impact your productivity under the Pomodoro timer. Once you’ve just settled in for a 25-minute session, someone can jump in and ask you a favour or even for some information to be emailed over, damaging that fresh new cycle you’ve just kicked off. Communicating with your colleagues or friends about your use of the timer and cycle is a strong way to enhance your productivity. Once they understand the reasoning and timings, they’ll reduce their interruptions and avoid distractions during your hard earned work session. The importance of breaking. Despite your workflow and energy during a session, taking the time to pause and break out will help you to optimise your performance in later cycles giving you the energy you need to continue. In essence, do not burn out when using the Pomodoro timer or this will discourage your own use. All of these tips and tricks will help to optimize your experience allowing you to master the Pomodoro technique to manage what needs to get done. Keep productive and let us know in the comments how you are using your Pomodoro timer?! We’d love to hear whether you’ve got some tips and tricks to conquering the 40+-year-old method of managing your time.